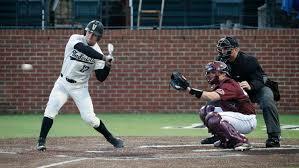 Walker Grisanti with a huge homer to right in the top of the 9th against the Dawgs (Photo Vanderbilt Athletics). Our baseball team is doin some serious work right now. Last weekend at the Hawk, we swept No. 22 Florida, winning Thursday Night, 5-0, behind the stellar pitching of Drake Fellows, who was named SEC pitcher of the week this week. Then we won Friday, 15-2, and Saturday, 14-2. This past Tuesday Night, we defeated Lipscomb, 15-1 at First Tennessee Park in Nashville. Here are the details. Last Thursday Night, Drake pitched a complete game giving up only 5 hits, 0 runs, with 3 walks and 8 K’s. He threw 116 pitches with 68 for strikes against 48 balls. Not the greatest ball: strike ratio, but Drake battled and pitched very well. He’s doing superbly. Right fielder J.J. Bleday had an RBI double, 2nd baseman Harrison Ray drove in a run with a single and left fielder Cooper Davis was 2 for 4 and scored 2 runs. On Friday, Saturday and this past Tuesday, the bats were cookin. Friday, we pounded out 19 hits and scored 15 times. Shortstop Ethan Paul was 5 for 6 with 6 Ribeyes. Ethan almost hit for the cycle with 3 singles, a double and a triple. He’s been spectacular this season as have a lot of our guys. Stephen Scott was 4 for 4 and scored 3 runs. DH Ty Duvall was 3 for 3 with 4 Ribbies including 2 doubles. Patrick Raby went 6, gave up only 1 hit, 0 runs, with 6 walks and 7 K’s. Like the strikeout total, but not the walks. Rabes threw 102 pitches, with 56 strikes against 46 balls. Would like to see our control keep improving on the mound. Jake Eder struggled in an inning giving up 2 hits, 2 runs with 3 walks, but I still believe Jake can help us. He throws it 95, and was electric at the beginning of the season. Hoping he can get that back. Ethan Smith and AJ Franklin closed out the game pitching scoreless innings in the 8th and 9th respectively. Saturday, we did it again scoring 14 runs on 12 hits leading to a 14-2 victory. Stephen Scott had another big game in left field going 2 for 4 with 4 RBIs. Stephen hit his 3rd home run of the season. Harrison Ray was 2 for 4 with 2 Ribbies. Third baseman Austin Martin was 3 for 5 with 2 RBIs, and JJ Bleday cranked his 7th homer of the season. Freshman Kumar Rocker was very good on the mound. Kumar went 6, gave up 5 hits, 2 earned, with 2 walks and 6 K’s. Kumar threw 106 pitches with 61 for strikes against 45 balls. It was a really solid outing. Kumer looks very probably to be our Sunday guy if he can keep this up. He’ll be our Sunday guy this weekend. Tyler Brown didn’t have his best stuff but Tyler has been superb this season. Tyler gave up 2 runs in 3 innings on 3 hits with a walk and 4 K’s. Really like Tyler out of the bullpen though. On Tuesday, we crushed Lipscomb, 15-1. Bleday hit 2 home runs, a 3 run homer in the third and a 2 run homer in the 7th. First baseman Julian Infante also homered, which is great to see. Pat DeMarco is injured right now and out indefinitely in left field so Scott has moved out there and Julian is at 1st. He’s got a lot of talent, he just really struggled at the plate last year, but he looks like he’s coming closer to playing like he did as a sophomore when he hit .310 and hit double digit homers and drove in 50 or 60 runs. Would love to see that because Corbs says what an awesome guy Julian is. Ethan Paul was 3 for 5 with 2 RBIs including a double, Austin Martin was 2 for 4 with a pair of Ribbies, catcher Philip Clarke was 2 for 5 with 4 driven in and Harry Ray was 2 for 5 with an RIbeye. Mason Hickman has really been spectacular this season. Mason went 6, gave up 1 hit, 0 runs, with 1 walk and 8 K’s. We’ll need Mason to keep being good for middle of the week starts and possibly weekend starts if one of the other 3 struggle. He’s doing extremely well. A.J. Franklin gave up a run in an inning and Hugh Fisher and Zach King finished it off. Our team ERA is 3.66 and our opponents’ ERA is 7.79. Rabes is 4-0 with an 0.57 ERA. Hick is 3-0 with a 1.50 ERA and Drake is 5-0 with a 3.68 ERA. Tyler Brown has 5 saves on the season and a 2.12 ERA. Kumar has a 4.43 ERA, but he’s been pitching much better and getting adjusted to the college game. He’s getting it and the arm talent is off the charts good. We’re fielding at a .982 clip and our opponents are at .964, so we’re doing well on defense after a little bit of a slow start. Overall, really like where our team is right now. Tennessee this weekend. We’re 20-5 and 4-2 in the SEC. We are ranked 6th nationally by D-1 Baseball, which has UCLA first, Mississippi State 2nd, Georgia 4th, Arkansas 8th, A&M 10th, Auburn 15th, Florida 23rd and Ole Miss 24th. That’s like wow. Tremendous conference once again. Tennessee is 2-4 in the SEC and 20-6 overall, so they’ve played well. Friday Night’s game is at 6:30 and will be streamed by SEC Network+. Saturday’s game is at 8 PM and will be broadcast by the SEC Network. Sunday’s game is at 2 PM and broadcast by the SEC Network. Drake goes Friday Night, Rabes Saturday and Kumar Sunday in all likelihood. Need to keep this incredible momentum going. Dansby Swanson is the starting shortstop for the Braves, Tony Kemp is a key piece in the Houston Astros outfield and 2nd base when Jose Altuve takes a night off, and Curt Casali is a valuable backup catcher for the Cincy Reds. All 3 of those guys are important pieces of their respective teams. What’s just as exciting is we have 5 pitchers starting today and this weekend in the majors. Mike Minor started for the Texas Rangers today at 3:05 PM today as they host the Cubs. Saturday, Sonny Gray will debut with his new team, the Cincinnati Reds, as they host the Pittsburgh Pirates. Great to see Sonny have a fresh start with the Reds. Sunday, Walker Buehler, who was my world series MVP in my baseball preseason predictions column yesterday, will start for the Dodgers at home versus the Arizona Dbacks Sunday at 3 PM CT. And Kyle Wright gets the start for the Braves Sunday Night at Philadelphia against Jake Arrieta. That game will be on Sunday Night Baseball on ESPN at 6 CT so super excited to see Kyle make his debut for the Braves in a pressure cooker in Philly against a usually top flight pitcher. David Price will take the hill on Monday at Oakland with a 9:07 PM CT start. That’s a late one, but will catch up on it Tuesday morning and have a report for you on all our players Tuesday or Wednesday along with our college team. DP had an unspecified illness in spring training, thus the reason for him starting at the bottom of the rotation for the Red Sox. Dave will be there when it counts. It counts Monday at Oakland. So, some really exceptional stuff going on for our college team and our guys in the bigs. We have a massive amount of guys in the minor leagues. Will work on keeping up with as many guys as I can to report here on the blog. While I was disappointed in the firing of Bryce Drew, it’s time to move on and find a new coach. Bryce is an awesome person, was dealt a bad hand when Darius Garland went down in game 5 with a season ending meniscus injury in his knee, and our team just couldn’t recover. Saben is one of my all time favorites because he’s got so much heart and a ton of talent, but he’s a 2 guard, not a point guard. We just never recovered from losing Darius. Sorry Bryce had to lose his job over some really unfortunate circumstances. He’ll do well somewhere else, I’m sure of that. For our candidates for the job now, Johnny Dawkins of UCF has gotten a lot of traction recently. He may be the guy, not really positive because there are so many different reports/rumors come in. Last weekend it was John Thompson III. Russell Turner of UC Irvine is a candidate. There are others. Dawkins has done an excellent job at UCF after doing a pretty solid job at Stanford, where it seems to be pretty tough to win as the latest coach, Jared Haase, is finding out. Johnny was a great player at Duke in the 80’s, played in the NBA and just took his Central Florida team to a 24-9 record this season and a tough, incredibly hard fought loss to Duke last Sunday in the round of 32, in which Duke benefited from some friendly officiating and a tip in by UCF to win the game almost impossibly rimmed out. Would be very happy if Johnny was offered and took the job. JTIII is a pretty good coach. He took Georgetown to 7 NCAA Tournaments in 12 years and even to a Final Four in 2007. So he’s been good. Turner has been at UC Irvine 9 years and led them to a 31-6 record and a victory over No.5 seed Kansas State in the first round of the tournament last Friday before falling to Oregon last Sunday Night. Looks like a pretty decent candidate. Heard the coaches from UNC Greensboro, Northern Kentucky and Murray State are in the mix along with others. I don’t want to give out any bad information, so I’m not going to speculate. Would be very happy with Dawkins. He’s a former Duke player, he’s coached at Stanford, so he knows the culture you need to have at an elite school. I would say he’s my personal favorite. His son, Aubrey, is one heckuva player too, so it would be awesome to have them both though Aubrey may choose to go to the NBA as he’s a redshirt junior. The other guys are good candidates. Would like to see Malcolm Turner make a decision pretty soon, and, of course, get the right guy. We’ve already lost one signee who has opted to get out of his National Letter of Intent. Austin Crowley, a 4 star shooting guard, has gotten out of his NLI. Four star power forward signee Dylan Disu and high 3 star point guard commit Scotty Pippen look to be in a holding pattern right now to see who our new coach will be. Matt Ryan and Yanni Wetzel are entered into the transfer portal. That doesn’t mean they are transferring, it just means they’re weighing their options. So we need to get the right guy in pretty quickly. The spring game is Saturday at 11 AM on the SEC Network. Deuce Wallace was taking the first team reps at quarterback, but he has a slight infection under his arm, so they’re keeping him out right now. Coach Mason wasn’t sure if he’d play Saturday or not. Riley Neal, our transfer from Ball State, will play a good bit as will 3rd stringer Allan Wallace, who I still like a lot along with our other guys at quarterback. We have quite a bit of talent at that position. Hope Deuce can play. He needs to as he’s missed a lot of playing time. Offensive line will be interesting to watch as we lost a couple of key starters off the front, but there is good talent and size returning. Ke’Shawn Vaughn is going to be spectacular if he can stay healthy. Same for Kalija Lipscomb and Jared Pinkney. We have a lot of weapons at our skilled positions. Ke’Shawn has good backups led by Ja’Veon Marlow, who is hurt right now and out for the spring, but I’m really excited about Marlow. We have Jamauri Wakefield too and some talent coming in in the freshmen class. Wide receiver and tight end have some exceptional talent. Defense is a competition for jobs. I’m excited to see Alston Orji this season. The 4 star redshirt freshman linebacker can be a force for us in the inside linebacker position along with the super Dimitri Moore, who was all over the field at the end of last season. We’ve got good size and talent on the defensive front, like our linebackers, and our secondary has a lot of good players. So our defense can be very solid and we have playmakers there who can get a lot of turnovers. We can have a good team this year. What that translates into victories, I’d say 6, 7 would be very good and 8 would be outstanding. Hoping to win them all of course, but playing Georgia in game 1 and LSU in game 3, though they’re at home, is tough. Florida, Ole Miss, South Carolina and Tennessee are also on the road. Kentucky, Missouri, UNLV, Northern Illinois and East Tennessee State are at home. We play on the road the second game of the season @ Purdue. That’s sandwiched between Georgia and LSU, so we’ll need to do well at West Lafayette. Will have more on our football team coming early next week with a progress report on the team after the spring game and a look at our incoming freshman. Also, will stay locked in on our basketball coach search, our awesome baseball team and our phenomenal players in the big leagues. Thanks. Brandt defeated Tiger Woods today 2 &1 at the Dell Technologies Match Play Championship at Austin, TX. Luke List defeated Matthew Fitzpatrick of England 2 &1 as well. That means Brandt and Luke led their opponents by 2 holes, won 2 more holes, with only 1 left to play so it’s impossible for their opponents to come back. Awesome stuff from Brandt and Luke.